MINNEAPOLIS — From taking his team to see Gophers legend Bruce Smith’s gravesite to making his “Row The Boat” mantra ubiquitous across town, new Minnesota coach P.J. Fleck has pulled out all the stops to try to bring some energy and color to a team that was frayed and sullen at the end of last season. 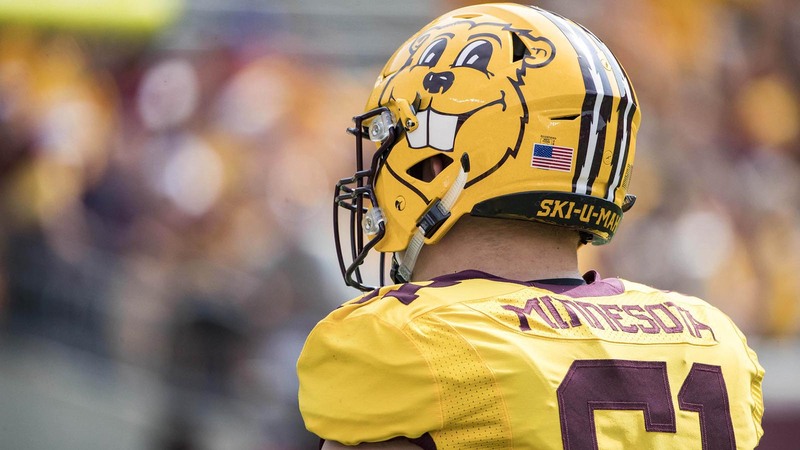 His latest move had the Gophers wearing mascot Goldy’s face on their helmets . A 3-0 start should work wonders, too. Kobe McCrary rushed for 107 yards and three touchdowns and Jacob Huff returned an interception 67 yards for a touchdown to lead Minnesota to a 34-3 victory over Middle Tennessee State on Saturday. Rodney Smith rushed for 107 yards in the first half before leaving with an injury and Conor Rhoda completed 11 of 18 passes for 122 yards in his first game since being named the full-time starter for the Golden Gophers, who wore all gold for the first time since 1974. “If we don’t have fun and we don’t enjoy our time together and we can’t celebrate the national champion mascot, celebrate our student body in one of the greatest cities in America, then why are we doing it?” said Fleck, who also sported custom Goldy sneakers in honor of the mascot’s birthday. John Urzua was 19 for 34 for 135 yards and two interceptions for Middle Tennessee (1-2) after starting quarterback Brent Stockstill was ruled out with a shoulder injury. Star receiver Richie James had just one catch before leaving early in the second quarter with an ankle injury. McCrary filled in well for Smith, dragging safety Alex Dale into the end zone on a 14-yard run in the second quarter that gave Minnesota a 13-3 lead. Canon Rooker’s 45-yard field goal served as Middle Tennessee’s only points of the game. Middle Tennessee: Urzua started three games last season for the injured Stockstill, so he has some decent experience. But without their record-holding quarterback and their most dynamic playmaker in James, they never really stood a chance. They continued to struggle running the ball, amassing just 46 yards on the ground. Minnesota: After a shaky opener against Buffalo, the Gophers have shown steady improvement in the next two games under new coach P.J. Fleck. They beat Oregon State 48-14 last week and had little trouble with MTSU this time. The big question will be whether Rhoda can become more of a factor going forward so the Gophers offense is not so dependent on the running game. “I’m going to do my best to get out there next week,” he said. Urzua had actually helped Middle Tennessee make more plays in the passing game in the first half than Minnesota, including four plays of at least 18 yards. But his first mistake was a big one, when he tried to throw a crossing route but did not see Huff coming from the other side. The Gophers safety read the play beautifully, closed quickly and intercepted the pass, sprinting 67 yards for the score and a 20-3 lead. Smith was the workhorse for the Gophers in the first half, averaging 6.7 yards per carry. But he took a hard hit at the end of the second quarter and gingerly trotted off the field. He did not play in the second half, but there was no immediate word on his health. Shannon Brooks, the other component of one of the Big Ten’s best backfield tandems, did not get a carry in the game after leaving Oregon State with an undisclosed injury. With Minnesota getting a bye next week, the Gophers may have been playing it safe to ensure he is ready to go for the Big Ten opener. Middle Tennessee: The Blue Raiders head back home to face Bowling Green on Sept. 23. Minnesota: The Gophers are off next week before they open Big Ten play at home against Maryland on Sept. 30.